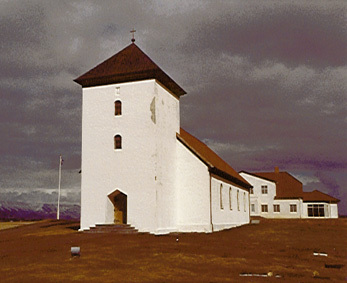 This is a picture of the church located at the Icelandic Presidents house just outside of the captial city of Reykavik. You can see the Presidents house in the backround. Notice no guards or high fences. Any one can come and visit the church and the exterior of the Presidents house. You can even attend church services with the President. Some of Icelands great leaders are also buried at this church. Iceland is a super safe country. Don't think Bill Clinton will let you get this close to him!